UCSF Site Builder is now better than ever, with a major new feature and other core updates. Introducing an all-new blog format to house your less formal, but still informative, news. Hand-tailor your blog’s title, tagline, and banner image to create a unique landing environment. 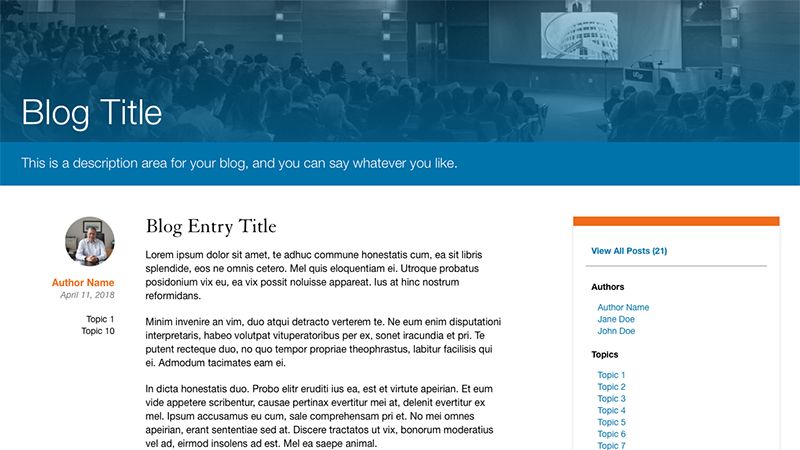 Create an optional, customized taxonomy to tag blog entries with topics. Easy-to-use filters allow users to sort blog entries by author, topic, and date. Create author bio pages that will automatically curate content, either with or without headshots. Add your most recent blog entries to any page. To pull content via RSS, add /feed to any blog-related URL, including filtered results. Your content editing toolbar now has two additional options that will make formatting easier. Spacing of some frontend mobile elements and issues with backend scrolling behavior have been fixed. Help users navigate your site by keeping the top navigation bar in place as they scroll down a page. Add a splash of color to your 2-column or 3-column content by selecting from 6 different colors per column area. If you have information you’d like to hide by default, such as an FAQ, you can now add it to any page. There are now a wide variety of buttons, both large and small. Each button has an optional full-width version, which is wonderful for consistent styling in smaller areas like sidebar blocks or columns. Tailor animation by choosing from a range of transition speeds, or turning off autoplay altogether. Encourage a user to take action by adding a large or small button. Add custom CSS without modifying the underlying style sheet. Allow users to navigate quickly and easily from commonly used blocks like News or Events. All profiles will pull in an associated image from UCSF Profiles, which can be replaced, if desired. Aliases and URLs can change without losing traffic or creating dead links. It’s our commitment to continue improving UCSF Site Builder with regular, quarterly updates. While there’s always more to do, we’ve simplified the user interface and improved the behavior of our homepage banners. You’ll see these changes take effect this Friday, March 3.